In this month’s blog post we are going to talk about a simple system called the Property Listing Opportunity Index (PLOI). This system will help you be a successful real estate agent by increasing your sales and commissions. For real estate principals, it will help your sales staff grow sales and increase the profitability of your real estate agency. We used something quite similar in our agency when we were in the real estate industry and found it to be of great benefit to not only increase sales but to also track performance and to help our sales staff get the most out of each property listing they brought into the agency, and to help them become a successful real estate agent. We were reintroduced to this type of system when we were listening to the podcast More Chess Less Whiskers that is hosted by Dean Jackson. You can listen to it here. Dean starts to talk about his version of it at the 1 hour, 1 minute, 15 second mark. We loved the way that Dean has used it with the Real Estate Agencies he consults within the USA and thought we would tell our members about it and help them grow sales and their agencies. It is a simple way of measuring how successful you are at maximising your opportunities. 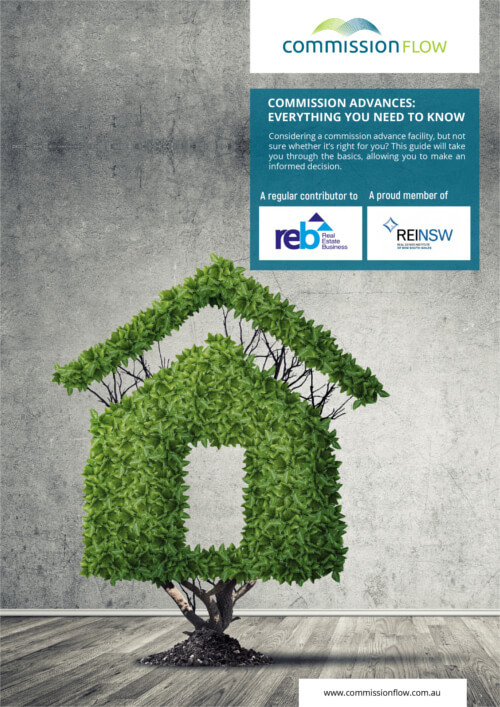 What is the Property Listing Opportunity Index? Each time you or your sales staff get a new property listing there are at least 5 opportunities that can go with it. So there are at least another 5 transactions that could result from getting that one initial listing. For the following exercise, we will work with the number of 5 possible opportunities. If you can think of more opportunities that can arise from listing a property, fantastic. You can add them to your Index and adjust the numbers as needed. It is a simple formula and can be fine-tuned where you think it can be improved upon. When real estate agents get a property listing the majority of them only focus on selling that initial property. Successful Real Estate Agents that are at the top of their game make the most of these other opportunities with or without even knowing it. Go back through your last 10 listings for yourself or for your sales staff, and look at how many points out of a possible 50 did you or they get out of their last ten listings. (10 listings x 5 possible opportunities each equals 50). List out the last property listings, then look at the number of other opportunities that arose from those 10 listings. How many referrals did you get that turned into a transaction elsewhere? If this isn’t something you are currently tracking, hopefully, you now see the importance of tracking these types of figures. If you have to guess these figures to start, so be it. At least get some figures down to start off with. You may even have to go back in time 6 months to get 10 concurrent listings that you can use. We know that in the property industry it can take time for deals to close and opportunities to see fruition. You can then build upon these figures, start tracking your activities and start building a reliable Property Listing Opportunity Index. Whatever you do, don’t lie to yourself. Don’t cherry pick a bunch of listings that make you look and feel good about yourself. This type of activity only works if you do it properly. You need to get 10 concurrent listings and get a baseline that you can work form in the future. You want a number that you and your staff can build on over time. When most agents start this process to see what their Property Listing Opportunity Index is, they typically have a figure of somewhere between 8 – 15. 8 because 2 of the 10 houses may not have sold, or 15 because they got all 10 of their listings sold (10 out of 10 listings sold), they may have been able to get 2 referrals that turned into other listings, and they found 3 buyers for other properties that they had listed. So their figures are 15 out of a possible 50. For this example, we will use 15. 10 property listings x 5 possible opportunities per listing equals 50. So 1.5 out of 5 is their current Property Listing Opportunity Index (PLOI). This is the baseline they start off with. This is what their current system, their current processes and procedures are returning for each listing they get. For every listing, it is returning 1.5 transactions. As Peter Drucker once said, if you can’t measure it, you can’t improve it. 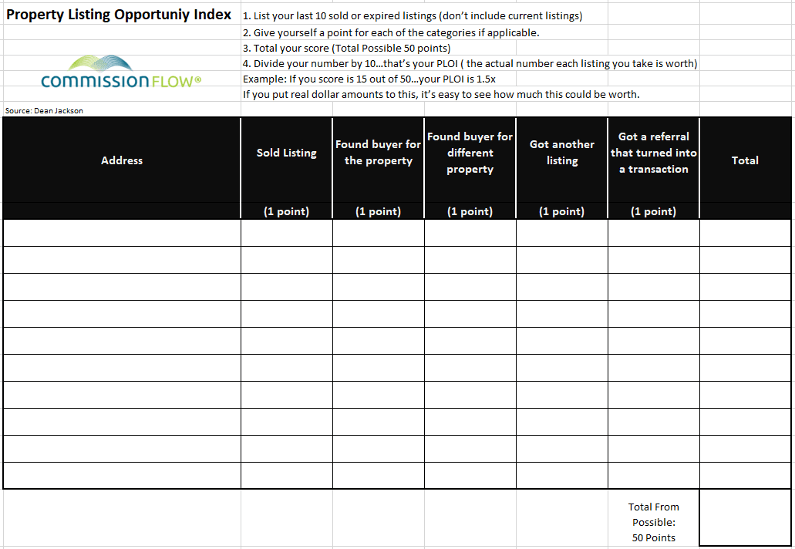 Once you know what your figures are for your Property Listing Opportunity Index (PLOI), you can now start to implement new or currently unused methods to increase it and get the maximum amount of leverage you can from each listing. You can implement the Property Listing Opportunity Index for your agency as a whole, and also implement for each individual real estate agent. The more you implement this system, the more you can hold yourself and your sales staff accountable for their activities. Each part of the year has its own ups and downs and fluctuations in the marketplace. The beautiful thing about implementing a system such as this is that you can track performance without comparing it to other parts of the year, when the cycle may be totally different. Likewise, if you compare performance from this year to last year you may be shortchanging yourself if the market is performing better this year when compared to last year. Or you may be unrealistic if the market has slowed down and you are expecting figures to be the same as last year’s. The PLOI system will at least tell you if you and your sales staff are doing everything you can, to be successful. Whenever there is a change there can be barriers to implementation. Some people don’t like to change the way they do things. Some don’t like to have extra KPI’s enforced upon them as they fear failure. Encourage your staff to participate. Show them it is in their best interests and will help them to become a successful real estate agent. Some simple calculations can show them how much more money they could be earning in commissions if they implement this type of system. If a real estate agent increases their sales by an extra 2 sales per month (which is very achievable), tell them how much more they will be making per month on average. Then show how much more commission they could be earning for 4 more sales per month, and up to what you think is actually achievable for your agency. When people have their own self-interest at heart, it is amazing what they can do. Also, look for other opportunities that we haven’t included. Push yourself and your staff to be the best real estate agents they can. Do you think this type of system will be easy to implement at your agency? Do you see any barriers to getting your staff to execute the Property Listing Opportunity Index? Do you think it will help your agency be more profitable and increase your sales? Is there any other topics you would like to see us cover that would help you and your staff become successful real estate agents. Make sure you come back and let us know how you and your staff went with the implementation. Here are a couple of downloads to get you on your way.